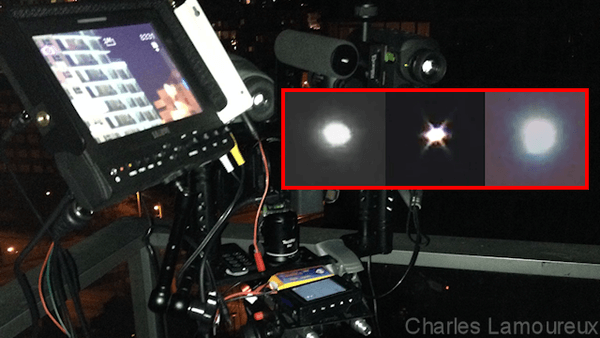 A new video published to YouTube on March 1, 2014, documents a stunning UFO incident recorded by one local astronomer’s triple-camera array from the deck of a Yaletown apartment in downtown Vancouver, British Columbia, Canada. Former skeptic now leading local UFO videographer Charles Lamoureux custom-engineered what he calls his “Skywatchers Mobile Unit” (SMU) imaging platform while anticipating nights with clear skies filled with mysterious objects. According to the witness, the UFO shown pulsating in the video during its initially slow-moving descent over West Vancouver’s Cypress Mountain was not anticipated by online satellite tracking applications, including Heavens-Above. The incident reportedly occurred at 8:44 p.m. PST on the night of Friday, February 28, 2014. Initially spotted at 50 degrees above the horizon, Charles Lamoureux offered a comparison between this object’s luminous performance with that of a Fourth of July fireworks display in an email sent to this reporter that evening. Such a brilliant display as the one shown in the video raises the possibility of other potential witnesses in the region who may have resolved this event either with the naked eye or by using their own camera systems. Readers of this column who witnessed this event are invited to contact Charles Lamoureux directly via comments on his YouTube channel, linked below. Click here to watch “Bright UFO Feb 28 WOW!” on YouTube, produced by Charles Lamoureux: “Please watch in HD and my commentary is from filming with Panasonic, other two cameras in sync. 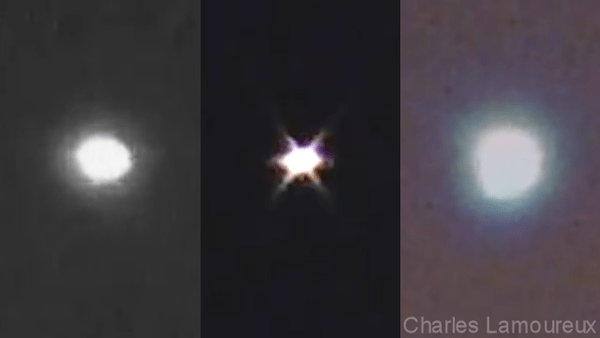 Finally able to capture UFO with all three cameras. This bright UFO was not a satellite or anything else as per heavens above and other satellite applications, not iridium flare, etc. Sighting occurred at 8:44 p.m. over Vancouver north descending behind the local mountain range in the Cypress park region. I must have seen over a dozen in a hour descend exact same area, some flashing, faster, but this one was so bright for sure there were more witnesses. The SMU imaging platform combines off-the-shelf technologies in a redundant array that allows near-infrared and visible spectrum observation and recording operable by a single user. Monochrome and color digital night vision devices are optically calibrated alongside a high-magnification HD camcorder on a single tripod base with signals routed to an external monitor that allows switching between images from each of the devices for real-time study of local UFO phenomena known to populate skies over the Vancouver region. In designing the SMU, Charles Lamoureux has carefully selected from a wide variety of options available to consumers in the videography and sports optics marketplace. Here’s a closer look at some of those components and what makes them especially suited to the task of resolving UFOs in the night sky. The Panasonic HC-V510 Full-HD camcorder is a consumer-series high-definition palmcorder emphasizing affordable high-magnification HD imaging via Panasonic’s Intelligent Zoom function. According to the manufacturer, Intelligent Zoom features 80x magnification power to draw distant subjects up close to the observer. While this camera’s tiny single 1/5.8″ BSI MOS Sensor and small-diameter 28mm-equivalent objective lens may offer some diminishing returns in terms of image over-sharpening and limited low-light sensitivity, the telephoto reach for something so small and portable (far lighter and more space-efficient than a telescope) remains very impressive. Click here to watch a brief step-through of Panasonic’s Intelligent Zoom function used to image the moon at full 1080 HD resolution. The Yukon Digital NV Ranger 5×42 is a reliable and inexpensive night vision optic that uses a digital sensor to resolve near-infrared images beyond the range of visible light. With a fixed 5x telephoto objective lens this monocular’s night vision sensitivity makes it a great spotter scope to aid in acquiring images with less-sensitive but higher resolution systems like the HC-V510 described above. Built-in NTSC video output capability allows for recording direct from the Ranger’s SD sensor to external portable DVRs and other devices. The Luna Optics LN-DM50-HRSD is a relatively new product first introduced in 2013 that has captured the attention of UFO skywatchers (including members of the UFONV forum) offering a built-in 720p HD recording capability as well as switchable black and white and low-lux color night vision images in HD resolution. Both affordable and innovative, the LN-DM50-HRSD’s low-lux color recording feature positions this device as a potential solid-state replacement for the legendary tape-based 0 lux professional series Panasonic AG-DVC30 “Ghost Hunters” camera. In simple terms of cost of operations, continued reliance upon purchasing MiniDV tape as a necessary consumable for operating the DVC30 is superseded by the convenience of the DM50’s ability to record digital files directly to inexpensive SD memory cards. In an email response to this reporter’s inquiry, Luna Optics, Inc. President Vladimir Savchik states further how his company will begin to release “a full-line of high quality digital products with even better resolution and image sensors and in a variety of shapes (monoculars and binoculars) with never-before utilized features and options” sometime in the near future. With new video from Charles Lamoureux already sparking the imaginations of UFO videographers on YouTube, the future for affordable do-it-yourself skywatching appears to be a very bright and promising one indeed.